Oven: preheat oven to 325�F. Remove Spiral Sliced Ham from film and foil. Place ham cut side down on a raised edge baking pan lined with foil. 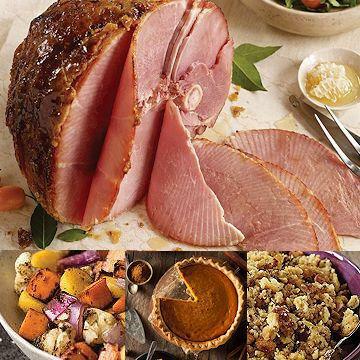 Heat, uncovered, for 60-75 minutes for entire ham or 10 minutes per pound for smaller portions. Roasted Root Vegetables 2 (12 oz.) pkgs. Do Not Thaw! OVEN: Preheat oven to 400�F. Remove plastic wrap from tray. Bake on a baking sheet 35-40 minutes until golden brown. Fluff with fork before serving. MICROWAVE (1100 watt): Remove plastic wrap from tray. Microwave on HIGH 4 minutes; stir. Microwave an additional 1 � minutes. Fluff with fork before serving. Thaw in refrigerator overnight or at room temperature for 2-3 hours. Remove all packing, slice and serve. Serve with whipped cream or vanilla ice cream. From Thawed: Thaw in refrigerator overnight or at room temperature for 4-5 hours. If desired heated, remove plastic packaging but leave pie in foil pan. Place pie on a foil lined baking sheet. Place pie on center rack in oven. Bake pie in a preheated 350�F oven for 15-20 minutes. Rest pie 5-10 minutes before slicing and serving. Single slices can be plated and heated in the microwave for 20-25 seconds on HIGH heat. From Frozen: Preheat oven to 350�F. Remove pie from plastic packaging but leave pie in foil pan. Place pie on a foil lined baking sheet. Place pie on center rack of oven. Bake for 35-40 minutes. Carefully remove pie from oven and wait 5-10 minutes before slicing and serving. Contains: Wheat, Eggs, Milk, Soy. May Contain: Coconut, Almonds, Pecans. Contains: Wheat, Eggs, Milk, Soy, Pecans. May Contain: Coconut And Almonds.